In 1678, the protestant preacher John Bunyan published what was to become one of the most widely-read books in the English language: The Pilgrim’s Progress from This World to that which is to come: Delivered under the Similitude of a Dream. On this wintry morning in Stockholm, we are not headed for the Celestial City – if we talk about the world which is to come, it is a world turned upside down by the consequences of ways of living which we grew up taking for granted – yet Bunyan’s title seems to fit this journey. And today, we are joined by an artist whose feet have followed long paths across Europe, the paths by which pilgrims have travelled through the centuries. Monique Besten is a walking artist: at the centre of her work are the encounters that happen on these journeys, the chance meetings and conversations, and the relationships that she weaves together as she walks. On her most recent journey, she walked from Barcelona to Paris for the COP21 climate conference. In a world of cheap flights and expensive trains and car manufacturers who cheat on emissions tests, what does it mean to walk for weeks to a destination that could be reached in an afternoon? (I am writing this, three days after the workshop, on a bus between Västerås and Uppsala, a journey that would take two days on foot – or one on skis, under current conditions.) And what difference does it make to walk as an artist, rather than as a protester or a holidaymaker? These questions are in the room, as Monique tells us stories from her walks. This month, Monique and Fredrik and Johan and I sneaked in to Kägelbanan, the day before the workshop, and played at being spiders. 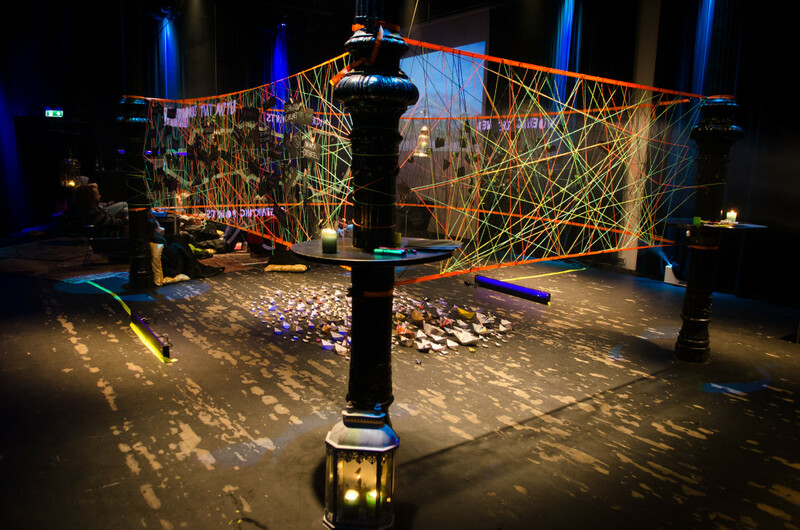 We made webs joining the pillars, four walls of string that became the background to the maps that the group would make together. I want to tell you about these maps. The first map is a map of language, a map of words that matter. This project started with questions like: what is the role of culture, under the shadow of climate change? What can we do, as artists, with this knowledge? We can’t make work that pretends that we don’t know. Nor can we pretend that art works as a delivery mechanism for messages – to treat art as a sophisticated extension of the Public Relations department, a low-paid advertising agency, is a misunderstanding. So we are searching for other answers. One suggestion is that art can offer other languages in which to talk with each other about the mess the world is in. The language in which we generally talk about this mess is a daylight language, an expert language, a language of facts and models and policies. You can see some of these words, clustered towards the left-hand side of this map, some in English and some in Swedish. You can probably think of others that belong there: climate change, sustainability, resilience, security, technology, resources. Art can remind us that other languages are possible, that other languages may be necessary, if we are to navigate the shadowed paths that lie ahead. The languages of night time and of twilight, of the ‘vargtimmen’ – the wolf hour, before dawn – that someone has added here, of the hour between dog and wolf. To say that other languages are needed is not to suggest that the daylight words should be abandoned, though it may mean putting them in question. Around the cluster of these words, I notice the pairing of ‘hypocrisy’ and ‘honesty’, and the injunction to ‘slow down’. My eyes cross the map to another cluster: ‘uncertainty’, ‘trust’, ‘grace’. We need words that touch parts of our lives that cannot be held at arm’s length. Others invite us to reframe our conversations. What happens if, instead of accepting the designation of the new phase in planetary history as ‘The Anthropocene’ – ‘The Age of Man’ – we talk about ‘The Humbling’? The second map is a map of the terrain in which we find ourselves – as artists, as people, as societies – when we start trying to face the mess the world is in. The idea is to name the sticking points, the places where we see ourselves or others getting stuck, but also the starting points, the landmarks that might help us find a way forward. Maybe you recognise some of these: ‘The Dragon of False Optimism’, ‘The Dead End of Dystopia’, ‘The Mountains of Madness’, ‘The Future City of Everything Is Gonna Be Fine’, ‘The Desert of No Conflict’, ‘The Great Swamp of Asking for Permission and Waiting for It’. At this point, we are channelling Bunyan’s allegorical mapmaking, and this seems to make it possible – not just possible, but playful – to give names to our fears and darknesses, as well as to the fragile zones of hope. There are images here that will stick with me. I’ve stood gazing out across ‘The Infinite Clearcut of Facts’, my heart sinking at its endlessness. With bare feet, I have walked ‘The Pebbled Beach of Guilt’ and sometimes arrived, unexpectedly, at the ‘Shore of Happy Meetings’. The third map is a map of widening webs: the people, projects, networks and organisations with whom it feels as though this work is or ought to be connected. Looking at this map, I see a reflection of the different roles we play. For some of us, building networks is at the centre of our work; for others, work happens in solitude, so that this day we spend together once a month is a chance to reconnect with a wider web. These maps were made quickly, in between the other activities of the day – and what I am telling you is only one route through each of them, there are other routes to be taken – but of the three, it is this last which feels most obviously incomplete. We are five months into our eight months together, just past the halfway point. If the first half was a journey inwards, now we have turned: it is time to start asking what we are bringing back that could be shared and how we could widen these conversations. So, at six o’clock, a small group of guests gather in the foyer of Kägelbanan, friends and strangers, people who heard the invitation that went out quietly over the past week or so. A camera at one end of the room captures how they enter in small groups, each group joined by two or three of the artists from the workshop, retracing the journey through these maps. Later, we gather in the space beyond the maps and listen for a while as Monique tells stories of walking across Europe in the soft armour of her suit, and then a group goes off to one corner where Anders reads from a script he’s working on, while others gather again around the maps or at the bar, talking in twos or threes. This was the first time since November that we opened up for the evening. Back then, we were charging for tickets, so we got an audience – but we realised that we are not looking for an audience, not yet. We are looking for people who care about the same questions that have brought us together. More than anything, we are looking for other artists and writers and musicians and performers who are willing to join us in this space. The invitation went out quietly, because we are still learning how to open this up. But people came – and I hope we made you welcome. You encouraged us to take this further. So we would like to invite you to join us for three more evenings over the spring – and to share this invitation with others who you think should be in the room, to help us widen the web a little further. The Dark Mountain Workshop is Anders Duus, Andrea Hejlskov, Andreas Kundler, Ayesha Quraishi, Clara Bankfors, Dougald Hine, Emelie Enlund, Jesper Weithz, Lisa Färnström, Liv Elf Karlén, Måns Lagerlöf, Ninna Tersman, Patrik Qvist and Ruben Wätte. This project is made possible by Riksteatern, the Swedish national theatre, in its role as expert support to the performing arts in Sweden.